French blogger Jean-Sébastien Volpé of un JOUR une MONTRE (which means something like “a watch per day”) features a different watch every single day. His readers submit a (wrist)shot of their timepiece with a small anecdote or explanation and Jean-Sébastien publishes them on his blog. Today, one of my own watches is featured on unJOURuneMONTRE.com. 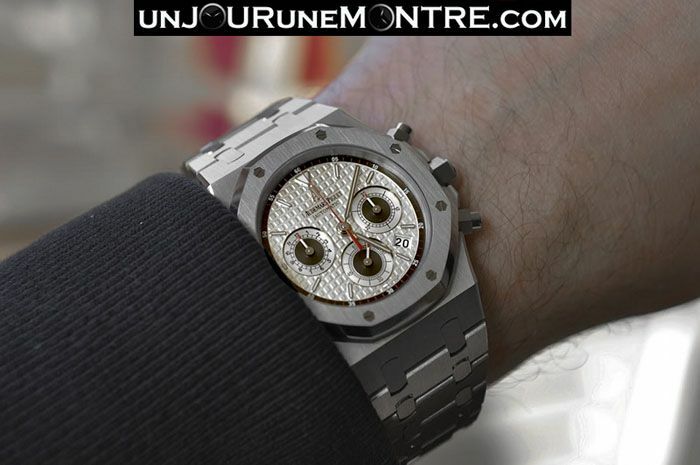 It is my Audemars Piguet Royal Oak chronograph ref.26300 that I purchased a few years ago. As the blog’s name already reveals, it is all in French language. However, an automatic translator on his website also makes sure it is readable in English and Spanish.